This versatile member of the mint family is often overlooked for use in the perennial garden. Let us try to change that. While crawling around the garden on my hands and knees one day, I suddenly found myself craving a cup of earl grey tea. Sniff, sniff. I knew that scent!! Although the scent is the same, the Earl Grey Tea flavouring comes from Citrus bergamia. 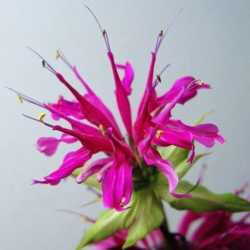 Monarda leaves and flower petals are edible and can be used for flavouring in cooking. Monarda leaves can also be dried and used in a medicinal tea to help with headaches and fevers. "Mom!! How come there's Bee Balm here?" She just grinned. You see, I like the different colours of Monarda mixed haphazardly together. She figured that they all needed to be separated. She'd tied different colours of twist ties on the stems when they bloomed. I had noticed those twist ties but it didn't occur to me their meaning. She'd been digging some of them up, matching colours, cutting them down to about an inch and then re-planting them. Indiginous to Eastern North America, Monarda, or Bee Balm, is another of my favourite perennials. They look fabulous in large patches, as seen in the photo of my garden at the top of this article. Mixed with Cone Flowers and Phlox, they present an astounding display of colour through most of the mid to latter parts of summer. Growing from 1 to 4 feet tall, they are rapid spreaders, like most members of the mint family. Quickly taking over an area if left to their own devices, their shallow root systems are also easily dug, or pulled up. Their rhizomes can easily spread a foot in a season!! The main reason Mom was messing with my Monarda patches was because the middle of the patch tends to die back with age, and dividing, or disturbing the rhizomes every 3 years or so helps keep them healthy. Monarda are Hummingbird magnets!! There are few perennials that can match Monarda in their ability to attract our favourite feathered friend. Plant them in areas where you spend the most time so you can enjoy this phenomenon. Easily done since they are happy in either full sun or partial shade. Also attractive to bees, Hummingbird moths and Butterflies. 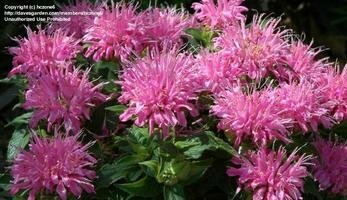 Monarda didyma prefer moist, well-drained soil but will tolerate a variety of soil conditions. Wild versions populate stream banks and ditches, any areas where the ground is moist and rich in organic matter. Apologies to our friends in the hotter States, where watering restrictions occur, as this one might not be a good choice for you. 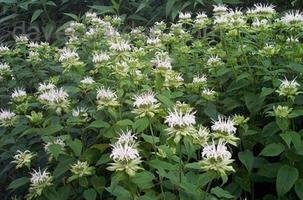 Southerners might have some luck growing Monarda fistulosa, or wild bergamot. This is a native that can tolerate drier conditions and also can be grown in clay type soils. 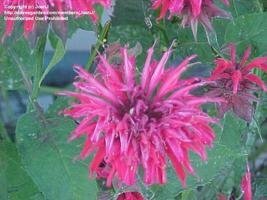 Monarda are susceptible to powdery mildew if stressed by drought. Thinning the patch to promote good air circulation will help prevent the problem. On the opposite end of the scale, they will develop root rot if conditions are too wet for long periods. 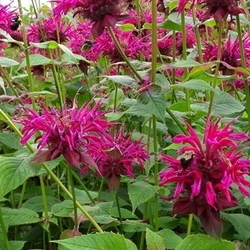 Good news for Northern gardeners, Monarda is hardy to Zone 4, and grows well up to Zone 9. I have no idea what varieties I have collected over the years. I gather colours, not names. I have red, white, pink and purple. Some are better behaved than others. The white stays where I put it and doesn't spread as quickly. The fastest spreading is the red one, but I don't mind. I need to find me a few of the shorter varieties. 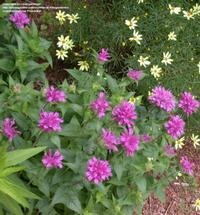 I think Monarda would be wonderful planted at the base of Clematis to shade their root systems. Their soft colour tones blend well with any perennial I decide to plant them with. I really do love them, and the scent of the leaves makes weeding something to look forward to!! 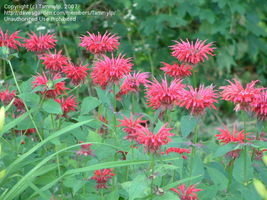 Give Monarda a try, I do believe you'll like them. Photo credit goes to myself, hczone6, JoanJ, poppysue, victorgardener and Tammylp. Thank you all for your wonderful Plant Files contributions!! 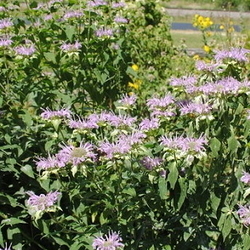 USDA Plant profile for Monarda fistulosa. See if it grows wild in your area. I am an avid gardener who shares my gardens with 2 other equally avid gardeners. I garden for fun and relaxation, never paying attention to the rules!! During the long, cold winter months I occupy my time playing with over a hundred house plants, my six cats and two dogs.